In 2003, an editorial1 in this journal alerted readers to the developing concern about misconduct in the sciences, and acknowledged that the extent of such misconduct and its various manifestations were largely unknown. In 2012, Honig and Bedi2 published the findings of a study in the prestigious Academy of Management Learning and Education journal in which they examined 279 papers submitted for the 2009 Academy of Management conference. They found that 25% of papers contained some degree of plagiarism, with over 13% evidencing significant plagiarism (defined as comprising 5% or more of the content). In addition, they reported that a greater amount of plagiarism appeared to emanate from countries outside North America. Against the background of these studies, and given the paucity of research relating to this problem, in the present study, located in a country outside North America, we have attempted to contribute to deliberations in this area. Plagiarism is intellectual theft14 and transgresses the fundamental values of the academy15, preventing learning, the dissemination of new knowledge, and the integrity of the scientific record16. Schminke13 notes how plagiarism is sometimes committed by experienced and established authors for whom the blame is apportioned to junior co-authors. Academics have a role to play in developing student moral literacy21 and a link has been shown to exist between the dishonesty of academics and student cheating behaviour22. Furthermore, academics have been found to be reluctant to report and take action on student academic dishonesty.23 Accordingly, it is important to understand research integrity or the lack thereof amongst academics themselves. We submitted 371 peer-reviewed articles that were published in 2011 in 19 South African management journals (spanning the major fields of management) through the Turnitin™ software program to identify similarities between the articles and other published material, i.e. to identify plagiarism. Once a manuscript is submitted to the program, it is compared against billions of Internet pages, online publications, journal articles and student assignments, dissertations and theses, and a report is generated that highlights the actual text that has been copied and indicates the percentage of similarity between that manuscript and those documents that appear on the Turnitin™ database. In the remainder of this article, this percentage is referred to as the similarity index. 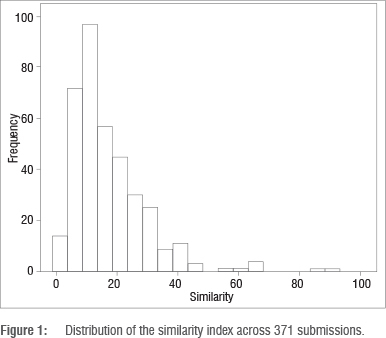 Across the 371 submissions, the similarity index (i.e. the percentage of similarity between an article and the documents in the Turnitin™ database) ranged from 1 (indicating almost no similarity) to 91 (indicating almost complete similarity). The latter pertained to a single article that was published in two journals under two different titles. Figure 1 shows that the distribution of the similarity index across the 371 submissions was positively skewed. In addition, several outliers were detected, which called for the use of robust statistics in subsequent analyses.26 The mean similarity index across the 371 submissions was 17.10 (SD=12.15), the mode was 9, the median was 14 and the 20% trimmed mean was 14.70 (95% confidence intervals: 13.61 and 15.89, Winsorised SD=6.67). To gain an overview of the relative frequency of plagiarism we categorised the similarity indices as follows: 1 to 9 as low; 10 to 14 as moderate; 15 to 24 as high and >24 as excessive. Table 1 summarises the frequencies in these categories. The most striking aspect of Table 1 is the proportion of submissions that fell into the high (27.2% of the submissions) and excessive (21.3% of the submissions) categories. Whereas one might have expected the bulk of the submissions to fall into the low to moderate categories, the results show that high levels of plagiarism are relatively common in these journals. If we use a cut-off point of 9% for the similarity index, then it is evident that 68.2% of the submissions were above the cut-off point. It is noteworthy that 21.3% of the submissions contained an excessive amount of similarity. We compared the 20% trimmed means of the similarity indices among the types of submissions. For submissions to journals in the DHET list (/7=201), the trimmed mean = 13.69 and Winsorised SD=6.15; for submissions to journals indexed in WoS (/=62), the trimmed mean=14.84 and the Winsorised SD=5.65; and for submissions to journals on the IBSS list (/=108), the trimmed mean=16.71 and the Winsorised SD=7.90. Robust ANOVA26 showed that there were no statistically significant differences in the trimmed means across the different journal categories (F=2.2, df1=2, df2=96, p=0.11). We also isolated the 10 journals with at least 20 submissions during the period under review (/=270 submissions). Across these journals the trimmed means of the similarity index ranged from 11.67 to 27.24. Robust ANOVA26 revealed statistically significant differences in the trimmed means (F=2.6, df1=9, df2=62, p=0.012), with a medium effect size (ξ =0.40). Robust post-hoc tests26 revealed that the differences could be traced to excessively high levels of similarity in one journal only (i.e. the journal with a trimmed mean similarity index of 27). We also examined whether single versus multiple authorship played a role in the similarity index of an article. The difference in trimmed means between three categories of authorship - single (//=169, trimmed mean=15.75, Winsorised SD=6.76), dual (/=148, trimmed mean=15.42, Winsorised SD = 7.08) and three or more authors (/=54, trimmed mean=10.65, Winsorised SD=4.28) - was statistically significant (F=9.6, df1=2, df2=115, p=0.0001) with a medium effect size (ξ =0.32). Robust post-hoc tests revealed that the similarity index of articles with three or more authors was significantly smaller than that of a single or dual authored article. No significant difference between single and dual authored articles was observed. We complemented the three robust analyses of variance reported above with standard analyses of variance and non-parametric Kruskal-Wallis tests, both of which yielded a similar pattern of results as the robust tests. Our results indicate that there was extensive plagiarism in 19 South African management journals during the period under review, confirming the findings of other studies.2,10-13 The findings also indicate that although one journal appeared to contain more plagiarised articles than the others, the problem of plagiarism existed across the board. The type of journal (i.e. whether it appears on the DHET, WoS or IBSS lists) was not a factor in the level of plagiarism. However, the findings indicated that articles submitted by three or more authors contained significantly less plagiarised material than did those articles submitted by a single or by dual authors. A possible explanation for this finding is that potential plagiarism can be more readily detected and corrected when several authors are involved. Conversely, a single author may more easily be able to hide plagiarised work. We suggest that the intense pressure on universities and their academics to increase their research output within short time periods, plays a role in this problem. In addition, academics are rewarded in a variety of ways for such output1,19, which can contribute to a culture of expedience and opportunism18. An additional problem of governance also emerges when one considers the payment of government subsidy to universities based on research output. If at least one author of an article is affiliated to a South African higher education institution, government will pay a research subsidy of ZAR120 000 per article, which may be proportionally split according to the institutional affiliation of authors. Excluding those articles submitted by authors not affiliated to a South African higher education institution (/=47), it was estimated that government paid ZAR32 400 000 in subsidies for articles published in these 19 journals during the period under review. Given that 21.3% of these articles contained excessive plagiarism, a government subsidy of almost ZAR7 000 000 was paid for questionable publications. The problem of human error in data coding always exists in studies such as this one, but we tried to minimise this risk by checking the data twice. The findings indicate the existence of plagiarism in the published articles we submitted for study. This finding has implications for government, for the universities to which the authors are affiliated and for the journals themselves. The culture of research expediency that may be developing in academic institutions in order to increase subsidised research output can have longterm implications for the reputation of universities. Their contribution to society can also be compromised in terms of both the dissemination of new knowledge and the upholding of moral values transmitted through the students who graduate from these institutions and who can be expected to be influenced by unethical role models.22 It is critical that the DHET engages with universities to devise measures to subsidise research output without inadvertently promoting the sacrificing of the quality of such research and inadvertently encouraging shortcuts, such as plagiarism. In a similar vein, internal rewards to academics should not be based on the quantity of research output without considering that a greater contribution could be made by researchers who publish fewer articles but in highly cited journals with greater stringency in requirements pertaining to quality. It is also recommended that, in order to preserve the reputation of journals, editors subject manuscripts to plagiarism detection through software programs and that the penalties for detected plagiarism be severe for authors. It is recommended that future studies of this nature explore the extent of plagiarism (if any) in journals related to other disciplines in order to ascertain whether this problem is pervasive in other fields as well. In addition, a qualitative study of the experiences of journal editors in addressing plagiarism may throw some light on how the extent of plagiarism, noted in this study, managed to appear in articles that are deemed to contain original material for which the DHET remits subsidy to academic institutions. We thank Ms Ziyanda Makupula for her assistance in sourcing some of the literature used in the article and Mr Richard Devey of Statkon at the University of Johannesburg for assistance with the initial data analysis. A.T. was the project leader and was responsible for the literature review and the data collection. G.Pd.B. conducted the data analysis. Both authors were involved in the interpretation of the data and the writing of the manuscript.